If you can get past level 5, I lift my hat off to you. Erik vs Erik is a cute little game with great hand-drawn effect graphics that'll keep you glued to your seat until you have a bad case of RSI in your right hand. Remember Pac Man? 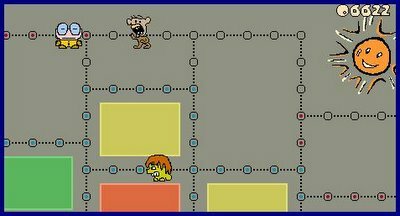 Erik vs Erik is like a cross between Pac Man and Pixel Panic... get the dots, surround the squares, avoid the other Eriks (Speedy-Pumpkin Erik, Zombie Erik, Baby Erik, Bad Complexion Erik, and Monday Morning Erik). Collect all the dots around a rectangular section of the play field to fill that section and score points. If any of the other Eriks are around a rectangle when it's filled, they are sent home. Fantastic! More exciting than Ludo, that's for sure. I've got to prepare a lesson for tomorrow morning. I need to be doing that next or I'll turn up at 9:30 with nothing to teach and a fearful, haunted look on my face, then the students will revolt and I'll be dejected and unemployed all at once... quite possibly my car will break down, I'll put on a stone and a half in unexplained weight and I'll break out in spots (and we all know what happens when I break out in spots)... Spar will have run out of toothpaste, I'll become hideously unnattractive, Imp will leave me and I'll become allergic to beer and pizza. So you see, I really should go and write this lesson. Hey! You won't become unattractive and I won't leave you. ( obviously I might have to consider it if you've not finished preparing your lesson!) NOT REALLY. Always expect the worst, that's my motto. Apart from that I'm a cheery little thing, as you well know. The grumpy git thing is a cunning ruse to throw you off the scent, keep you grateful and to prevent people asking me to do baby-sitting. Why oh why do you taunt me with these links that are brutally blocked at work by Websense? Sorry. I'll try to find some that aren't. ...just wondering: what was your lesson about? are you a teacher? for some reason I thought you were a home repair/renovator/master fixer upper! Hiya phi! I'm a Community Outreach Worker for adults with learning difficulties or poor basic skills. As part of my job I teach a dyslexia class and a blogging class (for adults with dyslexia). Today was blogging. I used to be a construction worker... (amongst other things). That'll be where you got that from, kg. btw, I had a post about dyslexia last week, perhaps when you're finished pulling the house apart, you'd like to pop over for a coffee and sprinkle some words of wisdom? your job is simply great. I've loved teaching, it has made me really feel helpful.